V-Moda’s Vibe II is the second version of the Vibe series. The Vibe II has been re-designed with improvements over the last iteration. In addition, support for cell phones kept in mind with the inclusion of a microphone. The Vibe II headphones aren’t just the average pair of retail store headphones, but rather also make a fashion statement and boast superb audio quality. The V-moda Vibe II headphones are by far the most unique pair of headphones I have had a chance to use. The quality and style of the packaging alone gives a great impression of the caliber of the product. Unfortunately opening the packaging is a difficult and painful task. Once removed from the packaging, at first glance the things that stand out the most would be the cable material and the ear buds. Unlike the plastic and rubber coating found on most headphone cables, the Vibe II is actually covered in a Kevlar fabric. The cloth gives the V-moda headphones a distinct and noticeable look. The headphones also feel a lot more like clothing when worn compared to traditional ones. In addition I found the cables to be more resistant to becoming tangled and easier to straighten out. The one major concern would be the durability of the material, however even with a few weeks of use; they didn’t show any signs of wear. 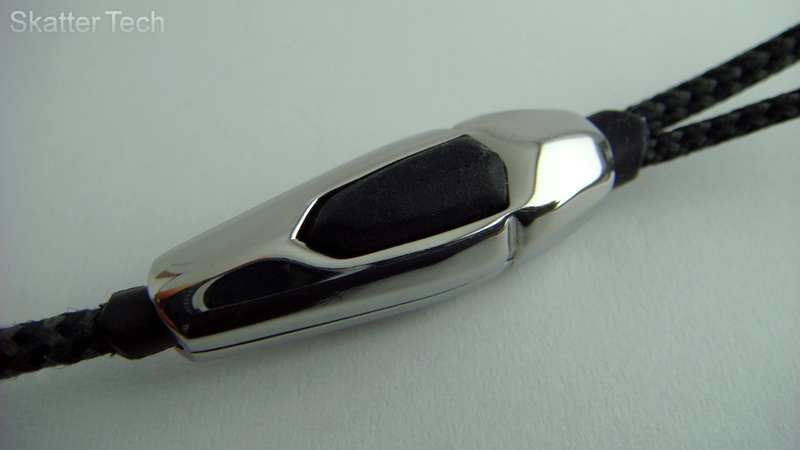 The second most notable feature would be the ear buds, which look like a piece of jewelry. The shinny coat makes them quite apparent. Both men and women will find the style attractive. Not only are the looks great, but the build quality is excellent and they sound great. The Vibe II is compatible with just about any standard MP3 player on the market that has a standard 3.5mm headphone jack. 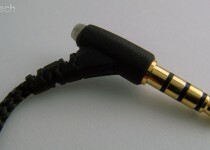 To utilize the built-in microphone found in the middle of the cable between the right ear bud and the Y-split, a compatible device is needed. The Apple iPhone, RIM BlackBerry, Palm Pre, or just about any new smart phone on the market will do just fine. A single control button is also featured on the headphones right before the Y-split. On my iPhone 3GS the button can be tapped once to either answer an incoming call or to end a call that’s already in progress. When the phone is idle, a single tap initiates music playback and another tap pauses it. A double tap skips to the next track and an awkward triple tap falls back to the previous track. Holding the button down for a second or two launches the Voice Commands feature. The Vibe II has all the features found in most headphones made for mobile phones today. There are no special features other than unusual materials used. 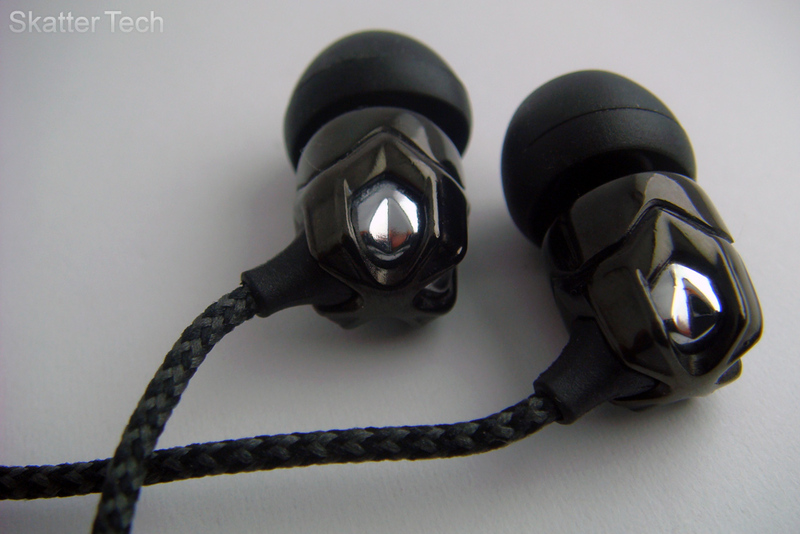 As for the audio, the earphones offer fairly good sound isolation. There is a fairly more than normal amount of bass produced by the earphones, which some may actually prefer depending on the genre of the music being played back. These aren’t the best of high-end headphones so naturally, some high notes do get dropped. Despite that, these headphones are almost guaranteed to sound exceptionally better and to be preferable to just about set of buds included with a device. If fashion isn’t an important factor for you, a pair of Shure headphones will probably offer superior audio quality for the same price. A tight and comfortable fit is quite important to isolate external noise and keep your music from fading away. To meet that requirement, V-moda includes a total of eight pairs of ear tips. There are two pairs of extra-smalls, smalls, mediums, and larges. One pair for each size is black while the other pair is translucent white. In addition V-moda includes “ear-hooks” to prevent the earphones from falling out when jogging. The two attachments easily latch onto the cable, fit tightly and discretely behind the ears. When the ear-hooks are in use, the ear buds actually enter your ear canal upside down rather than the traditional way. I found both methods of wearing the Vibe II to be fairly comfortable. 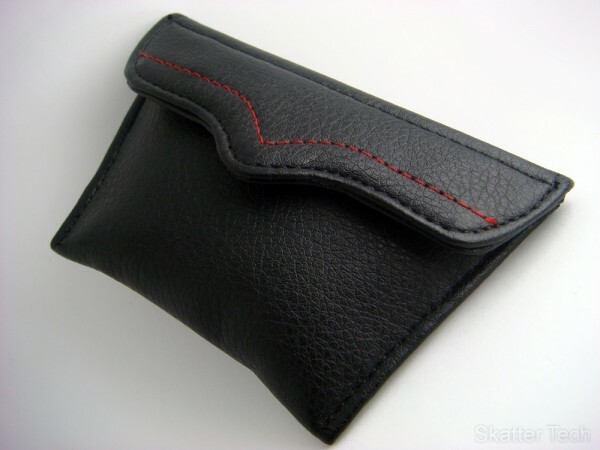 As for other included accessories, the Vibe II also comes packaged with a compact soft leather case with vibrant red stitches. They can easily can fit the headphones and the ear-hooks, however it might be a bit of a tight fit to also try to squeeze in the additional ear tips. Overall the V-moda Vibe II headphones are an excellent pair of headphones. They are quite fashionable and offer far better audio quality than the generic pair included with an Apple iPod/iPhone, Sony Walkman, or Creative Zen. The largest drawback would have to be the price tag. The Vibe II cost nearly $120, which is a bit more than the average consumer will probably spend. In addition those willing to spend the cash for high quality audio will probably rather invest in a pair of Shure or Ultimate Ears headphones. However if you are looking for something flashy, that has a unique look, and will grab people’s attention, the Vibe II definitely won’t fall short. The V-Moda Vibe II headphones are available for purchase online and in many retail stores today.